The channel has released two new promos of August 24, in the first promo of the episode contains against to Snehan who seems as very angry about the throwing balls task. It looks like the housemates divided into two groups and trying to win a task. Snehan, Suja Varunee, Vaiyapuri, and Bindhu Madhavi are one side. Arav, Kaajal, Raiza, and Harish are another team. Ganesh is the head (umpire) of this task. From the Bigg Boss Tamil August 24th episode promo 1, there is a task between two teams. One of the team wants to destroy the Paper water cups from both side which is building by opponent team’s player at center. The promo video shows that Snehan and team is trying to destroy the cups which is building by Raiza with the help of other team mates who all protect the balls from the opponent teams. All the Snehan’s balls are targeted Arav and Kaajal, not to the Cups as per the video promo. At the end of the promo, Kaajal telling to Raiza that Snehan got full of angry, it was reflected on his face. In other camera, near to Snehan bed, it shows he is upset because of the game. In the second promo of the Thursday’s Bigg Boss Tamil episode, Suja Varunee submitting her statement about other inmates who all avoiding her in the Confession room to Bigg Boss. 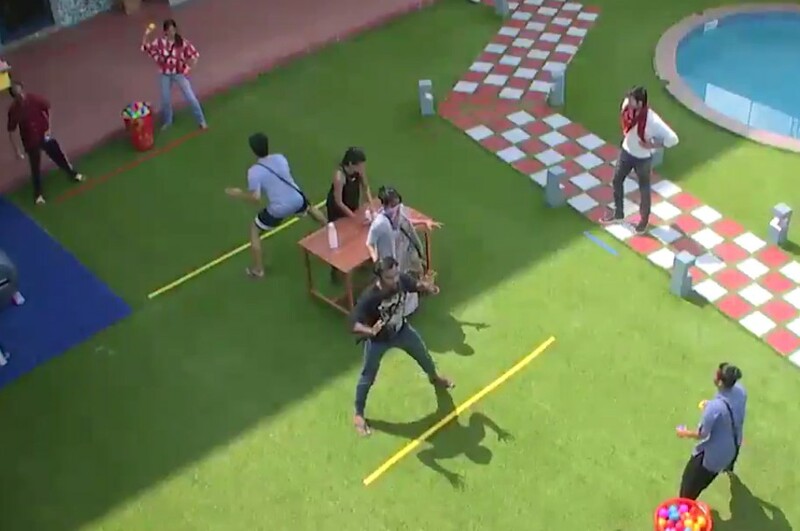 In other side of the same video, Vaiyapuri is imitating Suja Varunee’s activities and also he telling to Raiza and Arav that she doing all the things as same as Oviya. They both also accepting that she is trying to cover the audience by doing such things. Suja telling to the Bigg Boss as she don’t know what others are talking about him on her back and also she felt hard about the response by the other inmates. In this week 9, Raiza, Snehan, and Vaiyapuri was nominated to eliminate from the Bigg Boss Tamil. Know how to vote your favorites and save them by using online Google search and giving missed call.